Can be used for children up to 50 lbs. Little Tikes has taken the typical style of a rocking horse and given it a new twist. 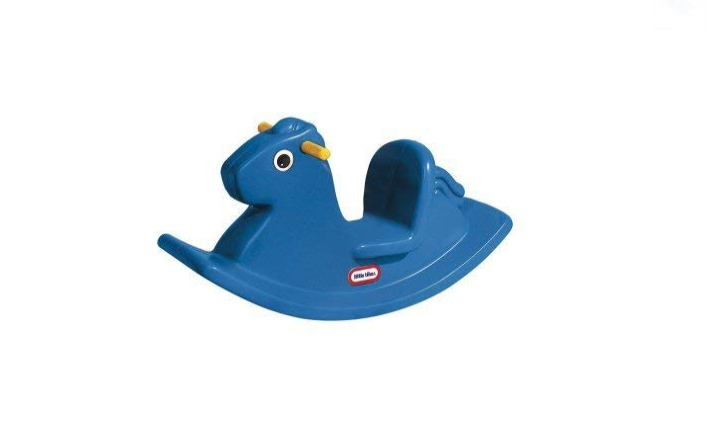 This rocking horse is created with a graphic blue hue and had all of its edges and corners smoothed out to prevent injury. By using this wonderful toy horse children will get the opportunity to learn valuable skills like balancing and coordination. Not only that but this is one very gleeful horse that loves to soothe and rock your child, his construction had made him so durable he will last you and your children’s children for decades to come. This traditional rocking horse is perfect for children to let their imaginations run wild as they gallop all around their house. It will rock smoothly indoors or outdoors, and it is small enough and light enough to fit perfectly in any play area. This class rocking horse has been designed with some great features to keep your little one safely rocking the day away. All of the edges and corners of the horse have been smoothly rounded. The saddle was designed to sit low with a high resting back designed to ensure your child maintains stability. The horse has easy to grip handles designed specifically with little hands in mind, and the horse itself is a small perfect size for indoor and outdoor use. When you purchase this lovely little rocking horse you can also be sure that it comes fully assembled so there is nothing for you to do but open it up and get your little one rocking away. The recommended age group this classic rocking horse was designed for is children who are 12 months through 3 years old. Though perhaps with some help from an adult a slightly younger child that has the ability to sit up on his own could still enjoy this little horse just as well. Children are adventurers, they are curious, brave, and excited to try new things. These are all wonderful qualities, but unfortunately, these are some of the most common reasons that children misuse toys and fall down and get hurt. Usually these falls or tumbles are not very serious, but of course, as a parent, you never want to see your little one hurt or upset. For these reasons when using the Little Tikes Rocking Horse, you should always supervise your children to ensure their safety. If children stand up on the seat or if the seat gets wet they could slip off or fall, and if the child is rocking too hard or using the toy inappropriately it could tip over or even in some cases flip, which is why supervision is the best way to prevent these accidents from happening. The maximum recommended weight limit on this classic little rocking horse is up to 50 pounds. However, many people who have used this product and love it have claimed that allowing their bigger children to imaginary gallop on this horse under their supervision was not a problem by any means. Which is great for you and your child to get as much use from this horse as possible. From the moment a child arrives in this world a mother and father naturally rock their child. The benefits that come from a rocking motion are undeniable and the good news is that rocking on a rocking horse is just as beneficial as being rocked in a mother’s arms. Rocking a child is calming and soothing, the motion can help a child feel safe and secure. By having a rocking horse at home, you can teach your child a valuable skill to self soothe by rocking on the little horse when they feel scared or upset. The blue color of the horse is also very calming to a child. Colors are one of the most common ways that a child expresses emotions before they are able to fully grasp the concept of saying they are sad or mad. Having things that are calming and make your child feel safe is an important factor in creating a nurturing, wonderful environment for a child to grow in. This bright blue, cute and friendly horse is perfect for creating a happy, safe, and calming place for your child to play and grow in. Plastic, the material used to make this rocking horse, can last up to 450 years before it completely degrades. Which for you means that this rocking horse will last miles and miles of imaginary galloping for your child until they are too big for it. This rocking horse could provide your family generations of fun, sweet moments and memories. Your children can spend a childhood full of imagination and wonder on this horse only to allow their children the same pleasure when it comes time. A great investment is something that lasts a long time and provides both physical and emotional enjoyment and this little horse certainly does both of those things. Children’s toys are notorious for having complicated packaging, lots of assemblies, and being not so friendly for first time use. Little Tikes Rocking Horse does not have any of those problems. It comes in stress-free recycled packaging that allows easy opening. As for the rocking horse itself, it requires no assembly at all! This means all you have to do to get your child ready to start playing and rocking all day is just open the box and put the horse where you or your child would like the play with it. This product is so easy to use it would be ready to play on in literally a minute. Not only does it require no assembly for easy setup, but it also has easy grip handles so you can move it anywhere easily. It is safe to use indoors and outdoors meaning you only need one product for tons of fun. The actual measurements of the rocking horse are 33.5 x 11.5 x 16.5 inches which makes it perfect to fit in to any play area, in a hotel room, in a nursery, the living room, anywhere you have a little extra space. The rocking horse only weighs 8 pounds which makes it so easy and light to pick up and move to any room you want. The sturdy, easy to clean plastic material it is made out of also allows you to take the horse inside or outside whenever you want, and it won’t get ruined if it gets left in the rain or snow. The portability of this horse makes it so easy to take the fun wherever your life takes you and your little one without being stressed about a big, heavy, toy that just can’t come along for the trip. Laughter is the best tool for making a sour mood into a good mood, for making stress disappear, and for making a new place feel fun and safe. Laughter is also contagious when you see your child laughing and having so much fun they can’t contain their joy a smile is sure to find a place on your face and your heart is sure to fill with joy and happiness. We buy toys because they bring laughter, fun, and enjoyment, this friendly rocking horse is sure to bring your child plenty of enjoyment and entertainment. And as long as they are playing where you can see them, you can feel free to do whatever you need to get done while they are entertained. This rocking horse will bring your child so many days full of fun and imagination adventures you won’t have to worry that they will get bored of this toy anytime soon. As a mom or dad knowing all the benefits that come from allowing your child to play on a rocking horse beginning when they are very young and continuing as they grow. A rocking horse can be an essential for letting a child learn to balance as they begin to take steps for the first time. Using a rocking horse makes a child use their leg muscles and tummy muscles in order to make the horse rock, by doing this often a child slowly develops their motor skills. Not only is it good for their bodies, but it also shows them to see exercise in a good way. When kids are playing they don’t realize they are exercising, all they know is that they are having a lot of fun and enjoying themselves. By exercising regularly your child will be healthier, develop motor skills, be happy and feel more enjoyment, and they will tire themselves out by the end of the day allowing them to sleep throughout the night easier. Though children need to be supervised when playing on a rocking horse the type of plaything still encourages independence because the child can use their own muscles and strength to make the horse rock. As your child plays on their horse more and more they will begin to develop confidence and coordinate their motions easier. This confidence can even be expressed in other parts of life, play, and growing up. Your child’s safety is your number one priority and you want to purchase a toy that is going to be safe for them to use. Little Tikes has been producing good, safe, quality products for years and their rocking horse is no different. All of the plastic seams have been smoothed to prevent your child’s skin from getting hurt, it comes with a low saddle and a high seat back to ensure your child has lots of stability while rocking. It also has easy-grip handles designed for small hands so your little one has a good place to hold on to when they get going. The horse is closer to the ground than traditional rocking horses so even if your little one goes too crazy and falls off they don’t have a long way to fall so any accidents will be minor and they’ll be back to playing in no time. As with any toy, adult supervision is always important to ensure your child is using the toy correctly and safely and to prevent any accidents from happening in the first place. Overall this rocking horse is a very safe choice for your child. No one wants to break the bank on the newest, coolest toy and especially not on something that’s as timeless and classic as a rocking horse. Well, the good news is that you certainly will not have to break the bank to add this cute, friendly, colorful horse to your child’s collection. The low price makes this rocking horse a perfect addition to your little one’s play collection. Not only is it a low price, but it is a great investment for your child’s future development and enjoyment of play and exercise. 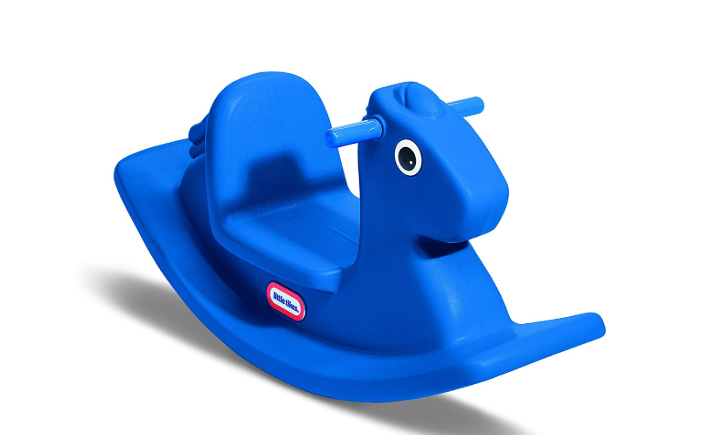 The bottom line on the Little Tikes Rocking Horse in blue is that this little horse is going to be a fantastic investment for your child. The price is very fair for all of the use you are going to get out of this toy. The durable, sturdy plastic material is perfect for both indoor and outdoor use and is super easy to clean. The design of the rocking horse is meant to ensure the safety of your child as they rock and play all day. It requires no assembly which makes it so easy to use. It also will encourage your child to develop motor skills, confidence, and independence. 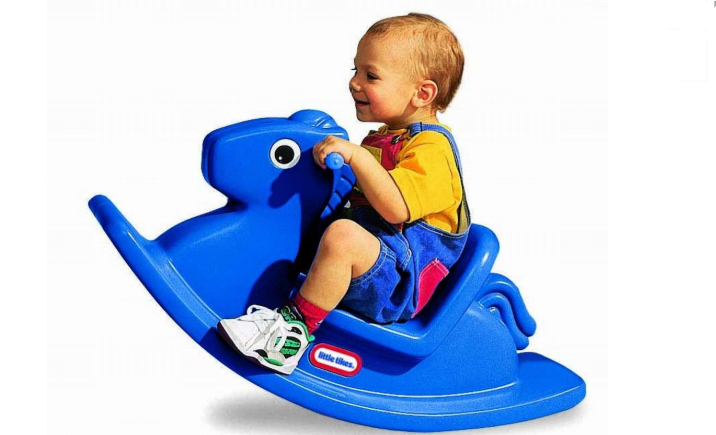 The motion from rocking can be calming for your child as well as the bright blue color and it just has so much entertainment value you are absolutely going to get your money’s worth from this wonderful rocking horse. You and your child will be able to enjoy this sweet horse for years and years.